As part of ‘Shop Bahrain’, the largest event in the Kingdom, the third weekly raffle draw took place at Bahrain Mall, Manama on Friday, 15th January 2016. 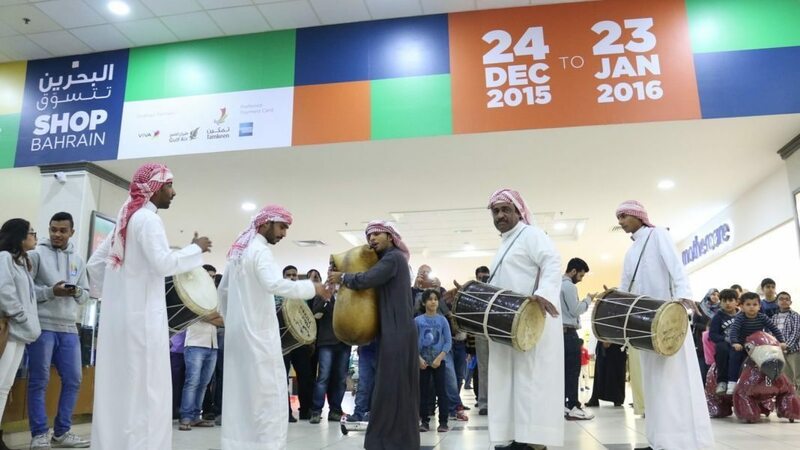 Prior to the raffle draw, mall visitors and shoppers enjoyed a traditional “Jirba” performance that gave them a glimpse of the Bahraini culture in addition to the general questions competition where they got the chance to win prizes. The raffle included three draws for each of the shopping tiers gold, silver, and bronze and was held at 7:00pm in attendance of a member of the Ministry of Industry and Commerce, the festival’s organizing committee, and the audience. A total of 31 winners were then announced from the three tiers. The winners expressed their contentment when contacted by the organizing committee for winning valuable prizes that comprised of a car, gold coins, air tickets, and electronic devices. The fourth and final weekly raffle is scheduled to take place at Al A’ali Shopping Complex, Seef District at 10:00pm on Friday 23rd January, 2016. The raffle draw that will be held for the grand prize will include all the registered shoppers from the three tiers who were shopping throughout the duration of the festival. Bahraini singer, Khalid Foad, will also hold a concert prior to the raffle draw. The concert will kick-off at 8.30pm. ‘Shop Bahrain’ aims to mirror the Kingdom’s position as an accessible and welcoming destination for families and visitors from across the region by providing a distinctive shopping experience filled with special offers and entertainment running until 23rd January 2016. For more information, please visit the festival’s official website www.shopbahrain.com or call the Hotline +973 17000710.